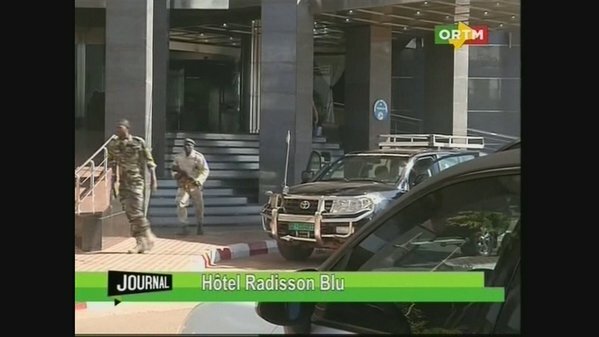 Just a week after the attacks in Beirut and Paris, France, a hotel in Mali was attacked by men who drove up in an SUV with diplomatic license plates. The men came in with AK 47 guns shouting "Allahu akbar" killing 27 including 2 attackers. CNN reported that 170 were held hostage at the luxury hotel. The perpetrators are believed to be Al Mourabitoun an allied group of Al Qaida. So far it seems ISIS has no involvement. One American is among the dead at the hotel. The attack happens at a time when the world has a heightened sense of alert and days before the Pope is scheduled to visit the Central African Republican. Vatican officials say the Pope still wants to go and does not want to use a bulletproof vest and will use the open popemobile. Vatican head of security Domenico Giani has traveled to Africa ahead of the Pope's visit to see the security plans. #PopeBars: 'Cool' Pope Francis a Twitter Hit!